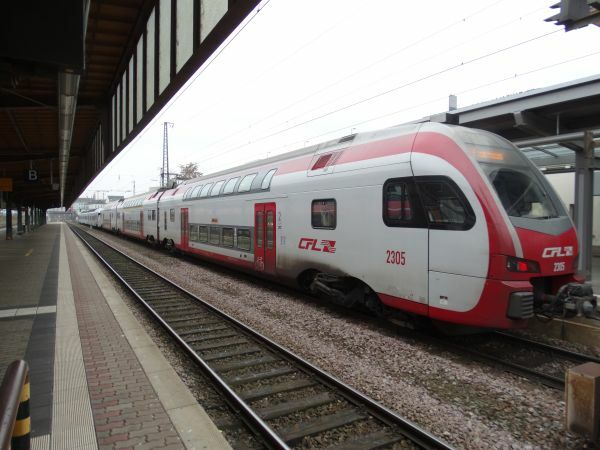 Luxembourg state railways CFL runs some passenger services from Luxembourg into Germany, for example the RE11 Regionalexpress line Koblenz-Trier-Luxembourg. In addition to that CFL Cargo runs cargo trains almost everywhere in Germany. CFL also bought a small private Germane railroad called neg, Norddeutsche Eisenbahngesellschaft Niebüll GmbH, which operates a short but touristically important route between Niebüll by the main railroad line and the harbour of Dagebüll Mole, from where ships take passengers over the strait to the famous holiday islands Föhr and Amrum close to the Danish border by the North sea. 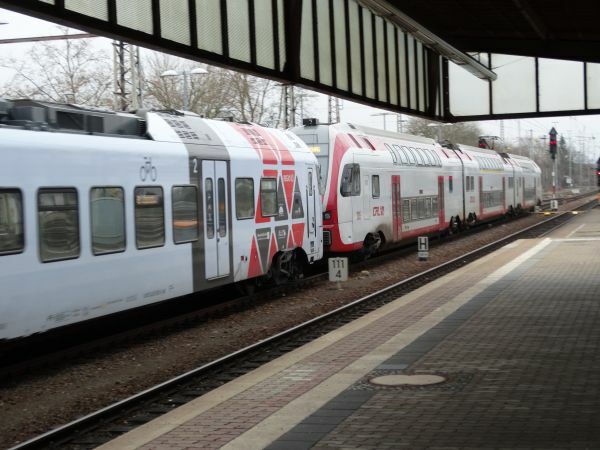 The picture above shows a CFL's doubledecker Stadler Kiss type train on line RE11 at Trier main station on 18.12.2016. Picture by Ilkka Siissalo. This picture shows a Luxembourg state railways CFL double decker Stadler KISS train (behind) coupled together with a German state railways DB train of type Stadler FLIRT. They run the RE11 regionalexpress line from Koblenz to Trier coupled together. 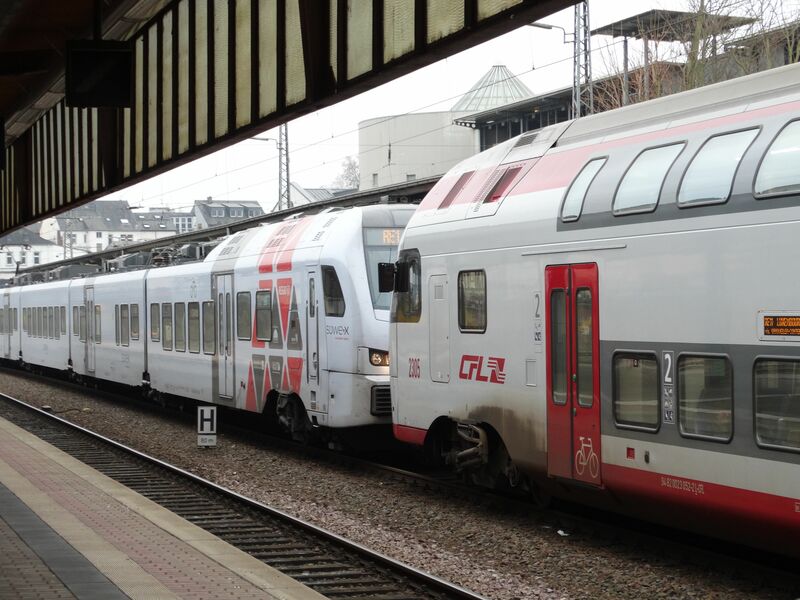 In Trier the units are separated and the CFL train continues to Luxembourg. This is a quite unique combination. Picture at Trier station 18.12.2016 by Ilkka Siissalo. Another picture of a CFL KISS kissing a DB FLIRT. Probably nowhere else in Europe regional trains of two national rail carriers run combined like this. Picture at Trier station 18.12.2016 by Ilkka Siissalo. A three coach KISS and a four coach FLIRT makes up a long train. Picture at Trier station 18.12.2016 by Ilkka Siissalo. 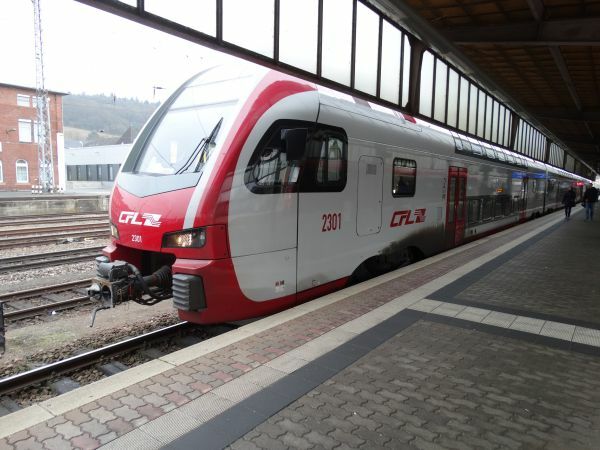 CFL bought already in the 1990s two German class 628 two coach railbuses, which were used together with similar German DB owned machines on the Luxembourg to Trier route. As they were freed up from that route and CFL had aquired the small German railroad neg in Niebüll, these two machines were moved there. This is one of the two, neg class 628 no. 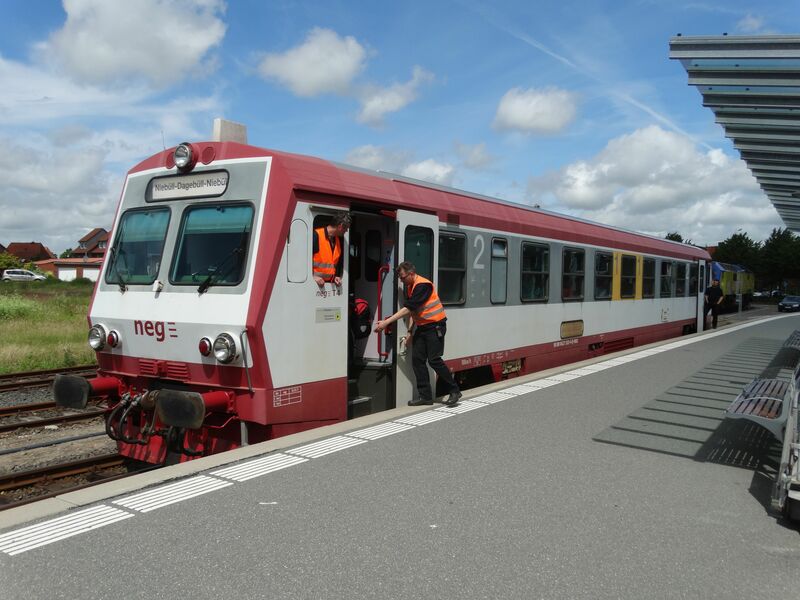 71 at Niebüll station 9.7.2016. Picture by Ilkka Siissalo. 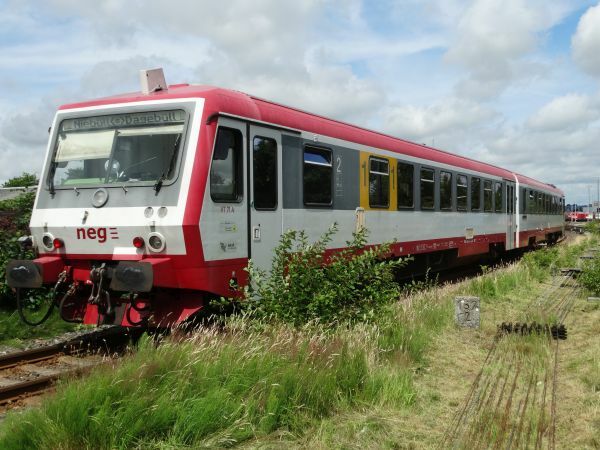 neg railbus T4 is an absolute rarity. It is of the class 627, which is a one coach variant of the common class 628 pictured above. Only very few examples of the class 627 were built and DB has none left. The very last museum example was burned down in a railway museum fire disaster in Nürnberg. But neg still has this one in almost daily use. 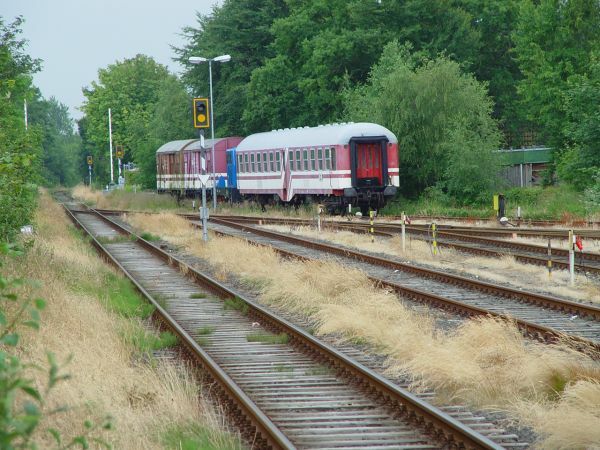 Note the cute 1st class "department" at the middle of the railbus - something "really necessary" for a 20 min ride :-) Picture at Niebüll station 9.7.2016 by Ilkka Siissalo. The railway company which is now called neg, used to be called NVAG or Nordfriesische Verkehrsbetriebe AG before CFL bought it. This is/was a NVAG class 211 diesel shunter in Niebüll in 2004. This is a machine from the ex-DDR, where the DR called it first class V23 and later class 102. After unification of the two German states the machines got the name Br 312. 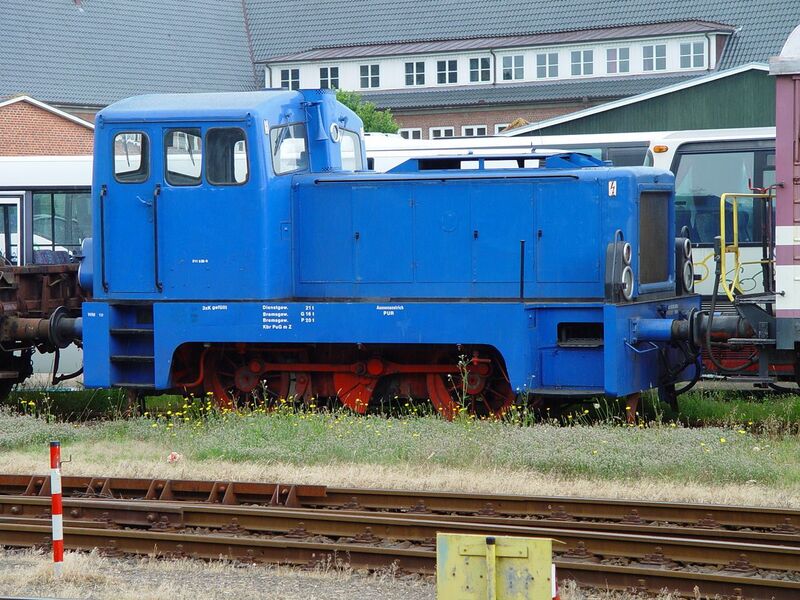 It was built by LKM Babelsberg 1967-70 as a light shunter. Top speed was 42 km/h. Picture at Niebüll station 5.7.2004 by Ilkka Siissalo. Former NVAG coaches. Picture at Niebüll station 5.7.2004 by Ilkka Siissalo.